Cross Country Ski all day and then cozy up to the fire in one of our warm, comfy cabins. Both classic and freestyle skiing is available here as well as snowshoeing. There are 19 different ski trails in Itasca County totalling more than 200K of trails. And Wildwood Resort is centrally located to all of them. Check out the Northern Lights Nordic Ski Club website for up-to-date x-ski trail reports and trail maps! Come up north to Wildwood Resort for some “real” cross country skiing – where the snow is deep, white, and fluffy all winter long. We have miles and miles of pristine skiing through heavy pine and hardwood forests, aspen-covered side hills, across lowland swamps and lakes, and beside beautiful scenic overlooks. The varied terrain makes cross-country skiing enjoyable for the beginner, intermediate and expert. Get the latest Cross Country Trail Conditions. You’ll find Wildwood’s cozy winter accommodations the perfect match to your great cross-country skiing vacation. Call us today to book your Nordic-skiing vacation: 1-888-328-5858. 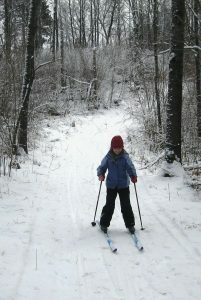 Cross Country Ski Rentals are available locally at Itasca Trail Sports (218) 326-1716. Click any of the maps below to open a pdf version of that map. Great Nordic Skiing in Northern Minnesota!